Review of Schlafly Oatmeal Stout | Beer Apprentice - Craft Beer News, Reviews, Interviews and Info. Hello again guys. 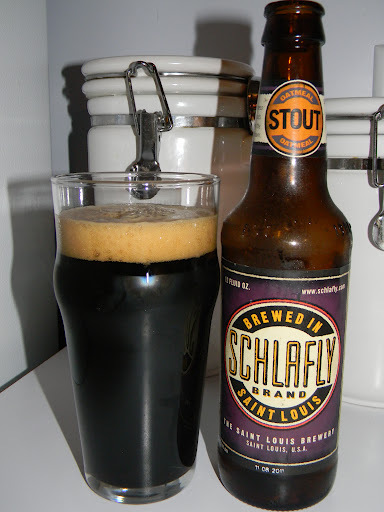 For today’s craft beer review I’m going to be trying the Schlafly Oatmeal Stout produced by the St. Louis Brewery located in St. Louis, Missouri. I love Oatmeal Stouts and this is one that I have not had previously, so I’m looking forward to trying it. From the website, schlafly.com, I found this commercial description of the Oatmeal Stout. Our Oatmeal Stout is a classic British-style stout brewed with flaked oatmeal and roasted barley. Freshly-roasted coffee beans, cocoa and touches of raisin and dried fruit dominate the aroma of this super-dark ale. The richness of the grain blend is balanced by the nutty character of the roasted malt, the creaminess from the oatmeal flakes and a dose of hops. Before the 19th century, all barley was malted over wood-fired kilns and the resulting dark roasted malt defined the browns, porters, and stouts of England. Near the end of the 19th century, brewers had introduced oats for their purported restorative and nourishing characteristics, producing beers such as oatmeal stout and milk stout. By the 1950’s, Oatmeal Stout had nearly trickled out of existence. Following the beer’s literary rebirth in the articles of English beer writer Michael Jackson in the 1970’s, British and American craft brewers are once again promoting the style. This beer has an ABV of 5.7% and it comes in a 12 oz. bottle. It poured a very, very dark brown with some some prominent ruby highlights shimmering at the bottom and along the edges of the glass. The head was a tan/beige color that was smooth and creamy, but of only average size. The retention time was so-so and the lacing was just “ok” in my opinion. The smell brought forth hints of roasted and toasted grain with some coffee notes and subtle tones of chocolate. Light fragrances of dried oatmeal and hickory nuts added a little bit of depth, but overall it seemed rather simple and straight forward. It wasn’t bad, although it wasn’t anything real outstanding either. It almost smelled a bit stale to tell the truth. Within the taste I found light touches of java along with some more of that toasted grain that I found in the aroma. Flavors of chocolate. Almost like dried cocoa powder. The oatmeal was there, but it seemed quite moderate in comparison to some other Oatmeal Stouts that I’ve had in the past. A decent bit of bitterness was accounted for, but again, like the nose, the overall flavor was rather simple, straight forward and none too robust. The mouthfeel was medium bodied, dry, smooth and a bit chalky. It didn’t really have that creaminess that some of the “better” Oatmeal Stouts have I didn’t think. No matter it was still adequate. The carbonation was ok and an acceptable amount of flavor was left on the palate after each sip. The Schlafly Oatmeal Stout was a respectable beer in my opinion. I think it had many of the proper characteristics of an Oatmeal Stout even though they were a bit reserved. It would be a great introductory beer for someone looking to explore the style that’s for sure. It was easy to drink, not too filling and would pair well with the cool Winter evenings. If you see it, give a try. I think you might like the simple aspects that this brew conveys. I’d drink it again.